The heats of the YFCU’s annual tag rugby tournament, which is sponsored by Danske Bank took place last week. The first heat was held at Rainey Endowed School for Co Londonderry and Co Antrim and the second heat was held at Portadown Rugby Club for Co Down, Co Fermanagh, Co Armagh and Co Tyrone. The tag rugby tournament has two sections, junior and senior. Teams consist of seven players with up to two substitutes. At least three girls must make up each team. Winners of these county heats then proceed to the final which will be held on Tuesday, July 31st at Rainey Endowed School. Robert McCullough, head of agribusiness, Danske Bank commented: “Danske Bank is delighted to be involved in this year’s tag rugby event as part of our platinum sponsorship. “The YFCU have always been keen advocates of combining learning and fun and that’s what this event is all about. “Players will develop teamwork, discipline and communication skills, which are important skills for their future careers. YFCU would also like to take this opportunity to thank Rainey Endowed School and Portadown Rugby Club for the use of their facilities. A note of thanks is also extended to Danske Bank and representatives, Robert McCullough and Mark Forsythe for attending the heats. Thanks also go to referees, Stephen Monaghan, Robbie Watson and Trevor Bradfield from Ulster Rugby, Lee McLaughlin, and YFCU referees, Geoff McNeill, Jason Clyde and Lynsay Hawkes and to stewards, Jessica Reid, William Beattie, Christine Maybin, Melissa Millar, Amy Richardson, Emma Malcolmson and Tilly-Jane Porter. 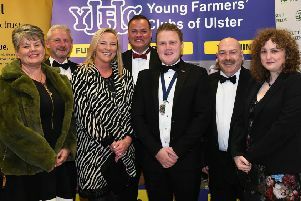 Randalstown YFC, Kilraughts YFC, Glarryford YFC 1, Glarryford YFC 2, Gleno Valley YFC and Coleraine YFC. Moycraig YFC 1, Kells and Connor YFC, Moycraig YFC 2, Randalstown YFC and Kilraughts YFC. Seskinore YFC 1 and Spa YFC. Spa YFC 2, Annaclone and Magherally YFC and Clanabogan YFC.